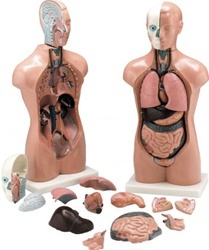 An outstanding value, this torso dissects into a total of 13 parts. 2-part head with removable half brain, 2 lungs, heart, liver, intestines, 2-part female genitalia, 2-part male genitalia, and torso on base. Size: 16-1/2" tall. Choking Hazard: Small Parts. Not for children under 3 years.